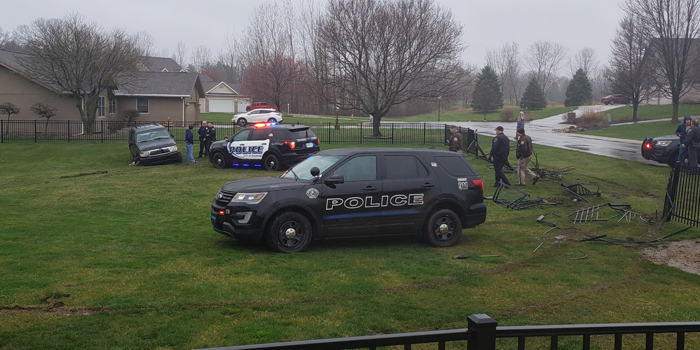 WINONA LAKE — A Silver Lake woman was arrested after a vehicle pursuit Sunday, April 14, near Stonehenge Golf Club in Winona Lake. At approximately 2:19 p.m. Sunday, April 14, Winona Lake Police Officer Riley Arvanitis attempted to make a traffic stop in the area of Merrywood Mobile Home Park on a vehicle operated by Skylar A. Stahl, 19, 108 N. Neer Drive, Silver Lake. Stahl refused to stop her vehicle, causing a pursuit to ensue. The pursuit left the roadway and continued onto Stonehenge Golf Course. During the pursuit, Stahl’s vehicle ran over a steel fence at a residence. The chase ended when Stahl’s vehicle came to rest against a marked police vehicle operated by Warsaw Police Officer Jacob Metzger. Stahl was arrested at the scene. No injuries were reported by those involved in the accident. Stahl was booked on charges of resisting law enforcement and possession of paraphernalia. Damage from the accident is estimated to be up to $10,000. Kosciusko County Sheriff’s Office assisted Winona Lake Police Department and Warsaw Police Department at the scene.